There is nothing like a fresh, brewed cup of coffee any time of day and Brooklyn Bean Roastery is one of my favorites whether it is coffee, flavored coffee or hot chocolate. 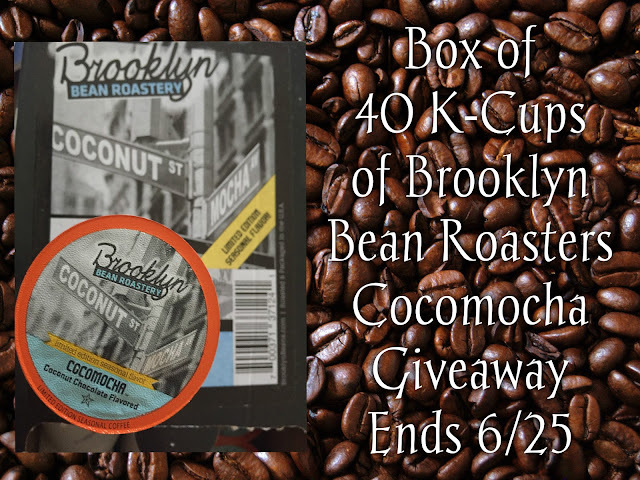 Some of my favorite flavored coffees come from Brooklyn Bean coffee and as a former Brooklynite I can tell you that Brooklyn makes some good coffee. Brooklyn Bean uses 100% Aracbica beans for each of their coffees and are roasted in good old Brooklyn. Cocomocha has a lovely blend of Coconut and Mocha creating a coffee that is perfect for morning, afternoon or evening. I prefer my flavored brews at the end of the day in lieu of dessert but what I like about Cocomocha is that it isn't heavy on either of the flavors involved making it perfect for any time of day in my book. These K-Cups worked with my Keurig 2.0 brewer. Check out Brooklyn Bean Roasters on their website to see all the flavors of coffee available. I drink three cups in the morning and a cup at night. I usually drink 3 to 5 cups in the morning. I drink 2, sometimes 3 cups of coffee daily. I can't without my coffee! I havent drank coffee for awhile although i am craving it alot lately. I can see myself drinking one to two cups a day. I used to drink at least 4 or 5 cups a day! I drink 1 cup a day. I drink my first cup of coffee in the morning to get me going and enjoy a second cup after dinner. I usually drink two cups of coffee a day. I drink a cup a day. My husband drinks about 2 cups a day! I usually will drink 2 cups a day.